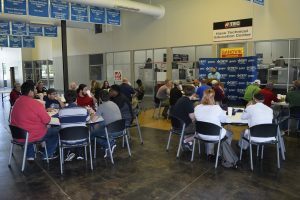 (WACO) – Several Texas State Technical College in Waco students and faculty members were honored Friday with a fries and hamburger lunch before departing this weekend for Louisville, Kentucky to take part in SkillsUSA’s 53rd annual National Leadership and Skills Conference. 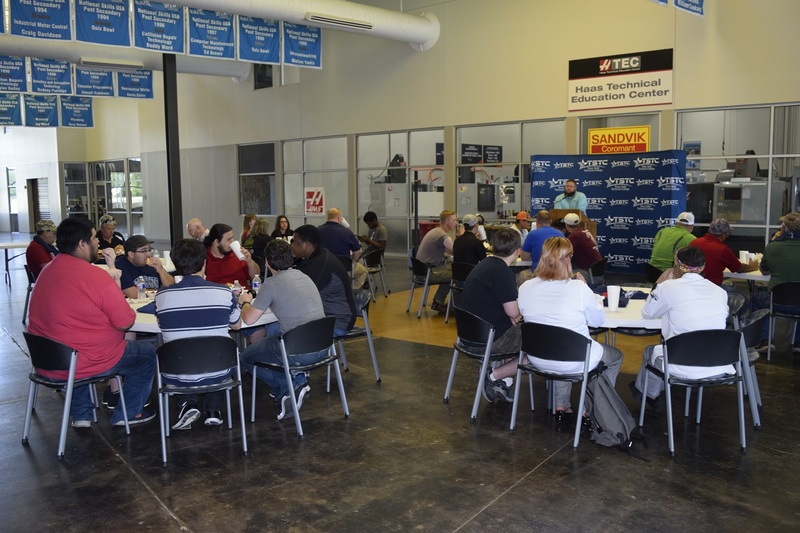 TSTC in Waco will send 41 students to the conference which brings together more than 6,000 high school and college students nationwide to compete in contests ranging from automotive technology to welding from June 19-23 at Louisville’s Kentucky Exposition Center. “Hopefully we are going to bring home some medals,” said James Matus, TSTC statewide SkillsUSA manager. Marcus Crespin, 21, of Victoria will return to the conference to take part in the Residential Systems Installation and Maintenance contest which he won the national gold medal for in 2016. Crespin is a Computer Networking and Systems Administration major scheduled to graduate in August. The national conference will mark Boyd native Logan Moore’s last work with TSTC. He graduated in the spring with an associate degree in Culinary Arts and will give up his SkillsUSA state presidency after the conference. Moore, 21, finished sixth in last year’s SkillsUSA Restaurant Service contest which he will take part in again this year. He has practiced for the contest in recent days with TSTC Culinary Arts faculty members. “I’m ready to compete and improve on what I did last year,” Moore said. Moore is eager to collect pins from SkillsUSA delegations. He said he was successful last year getting pins from all 50 states and U.S. territories and hopes to repeat the feat this year. The TSTC students qualified for the national conference by placing first in SkillsUSA’s Texas postsecondary competitions held in the spring in Waco. The group is scheduled to return to Waco on Saturday, June 24. For more information on SkillsUSA, go to skillsusa.org. This entry was posted in Waco on June 16, 2017 by Daniel Perry.